Griffin Civil is a Western Australian leader in civil construction and infrastructure development throughout regional WA. A family owned and operated business that spans several generations, Griffin Civil has earned a reputation for providing a high level of professional service and delivering projects on time, and on budget. 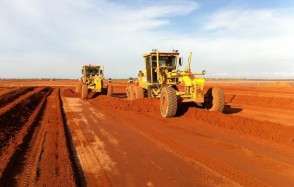 Griffin Civil specialises in the provision of bulk earthworks, roadworks, sub-divisions, stormwater drainage, plant hire and underground services in Western Australia. Griffin ensures all work is carried out in accordance with current state and national regulatory requirements. We have implemented a comprehensive Health, Safety, Environmental, and Quality (HSEQ) Management System that covers the pertinent elements of Quality Assurance (ISO 9001-2008), Occupational Health & Safety (AS 4801-2001) and Environmental Management (ISO14001-2004) standards. This system is certified by the Civil Contractors Federation. We are proud to have developed strong and long-lasting relationship with many of Western Australia’s major construction, mining and development contractors, as well as numerous local authorities and government departments. Griffin is an accredited vendor with FMG, Decmil, Rio Tinto (CAT 3) and Landcorp (Tier 2). For further information, email admin@griffincivil.com.au or phone (08) 9351 8773.